is intended to provide materials for inspiration for people interested in Hare Krishna philosophy and lifestyle. The Czech version of the pages is little more comprehensive containing recipes and Contact Center (free personal adds). But the best parts - Indian holy places - are here in English as well. The city of Puri — also called Nilacala and Sri Ksetra — is considered equal to Vrindavana and Navadvipa, the birthplace of Lord Krishna and Chaitanya. 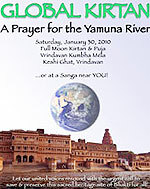 Varanasi is said to be the oldest inhabited city in the world. The Ganges, which normally flows southeast, reverses its course and flows north for a while at Varanasi, which is considered very auspicious. Story of Smt. Candrasasi Mukherjee, better known as Pisima Gosvamini, and her Gaura-Nitai Deities. 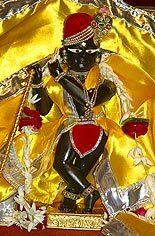 Small town on the bank of Yamuna river where Krsna performed His rasa-lila pastimes is among all holy places the most sacred one. An ISKCON temple in Vrindavan built by Srila Prabhupada is situated in Ramana-reti area where Krisna and Balaram performed Their pastimes. Raval is the birthplace of Srimati Radharani and nearby village of Dauji is the home of ancient Deity of Lord Balaram, Krisna's elder brother. Mahavana - Gokul is a place on the opposite side of Yamuna river where Krsna performed His childhood pastimes until He was three years old. The Govardhan Hill that was lifted by Krsna for protection of inhabitants of Vrindavan is one of the three things that remained in Vraja from the times of His pastimes 5000 years ago. Precise radix calculation brings interesting data for horoscope students and basic horoscope reading satisfies readers in general. The pond of Srimati Radharani near Govardhana Hill in Vraja is for Gaudiya-Vaishnavas the most sacred place on Earth. 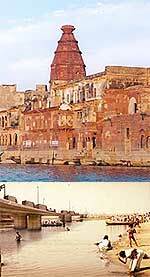 "Town of victory" with the fort where the original 5000 years old Govindaji Deity from Vrindavana is now being worshiped. The capital of Orissa with the temple of half Visnu and half Siva, Hari-Hara Lingaraja, is to be visited before going to Jagannath Puri. Sri Venkateswara (Balaji) Temple on the Tirumala hill near Tirupati is one of the most important Vishnu temples in India. It is the most visited temple in India and is one of the most visited religious places in the world. The highly impressive Meenakshi Temple is the main reason why pilgrims came to Madurai. Meenaksi was Lord Visnu's sister, who gave her in marriage to Lord Siva. Temple at Srirangam is the foremost of the eight self-manifested shrines of Lord Vishnu and it is also considered the most important of the 108 main Vishnu temples.